Another great hiking weekend. My original plan was to climb the Bös Fulen on Saturday and think about something to do for Sunday afterwards. However, Steffen asked who'd want to climb the Glärnisch with him on Sunday. "Being in the area" (more on that later) I thought, great! why not? I'll join you. So we agreed to meet at the Glärnisch hut on Saturday. I left for Linthal at 6 in the morning. Started the hike at 9. On my way up I met a downhill unicyclist (!) and a stampede of cows heading for the valley. I passed the car-free village of Braunwald, home of the famous Braunwald via ferrata. Once I reached the huge Karst formation landscape around the Bös Fulen I continued finding my own way without a marked trail. The Bös Fulen (translates to something like "evil foul") absolutely deserves its name. This is the first mountain yet that wasn't fun to climb and where I was glad to be down again. It's a huge pile of loose gravel of the nastiest kind. You take 2 steps forward and slide 1 back. This is really strenuous and really, really annoying. You take every.single.step. twice. It's also immensely dangerous since you keep getting into more or less minor rock slides that take the ground from under you and move you towards the many vertical drops. The mountain itself is constantly throwing boulders from above, playing darts with you as the target. The tiny glacier at its feet is littered with rocks fallen from above. No wonder I was the first to leave tracks in the snow on the summit ridge and the only one to enter my name into the summit book for 10 days. 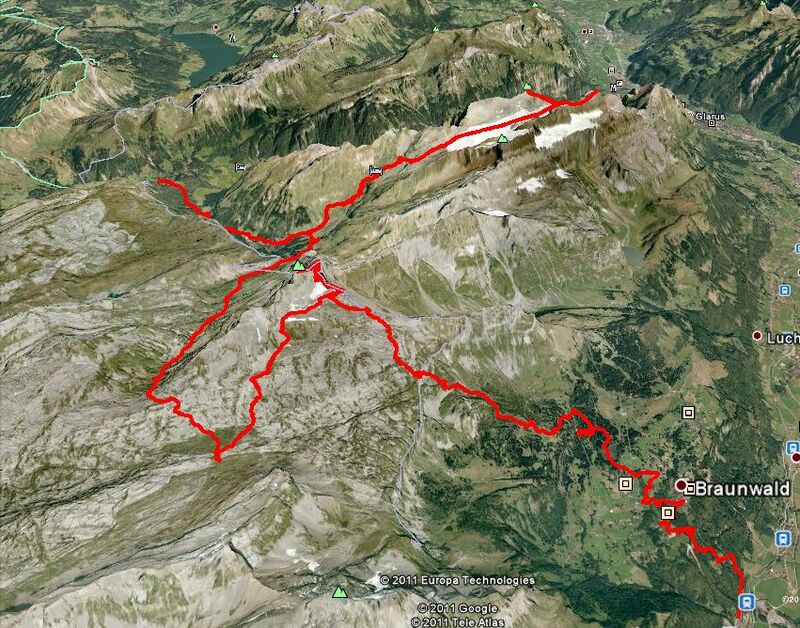 In order to reach our meeting point I had to circle the whole mountain and climb to the hut. All in all I'd end the day at around 10 in the evening after almost 13 hours of straight hiking. I covered a distance of more than 35km, climbed more than 3000m (!!!) and descended 1700m. I've outlasted my cell phones batteries so I couldn't accurately track the whole trip via GPS. It was like running a marathon. For that, admittedly, my time wasn't great. On the other hand I was carrying more than 12kg of gear, walked in heavy hiking boots and difficult, partly trailless terrain, gained lots of elevation and had to continue in the dark for two hours. So there ;-) All of that on a handfull of energy bars. By the time I finally arrived at the hut I was starving. Fortunately the crew was so nice as to give me an extra big serving of pasta which revitalized me somewhat. Official dinner time was long over so they cooked extra for me. Scrambling down the Ruchen we headed for the top of the glacier, the entry point to the Schwander ridge. You have to negotiate quite a steep drop to reach the ridge. Fortunately this has been well secured and turned into a short via ferrata section. In fact, the mountain sees so much traffic, that two routes have been installed which are used in a one way fashion. The ridge itself is nice: long and quite exposed with nice views to either side. Unfortunately we only caught glimpses of it because the clouds were moving in. The summit itself was a bit unspectacular because we were standing in the fog and in a crowd of people. There is some sort of fairy tale that gives this peak its name. Something involving a snooty shepherd daughter, a poor boy, a mother-in-law, a garden on the top of the mountain and a curse. Apparently the curse can be lifted if someone in true love kisses the right rock three times. No, we did not go around kissing stone. A sad fact is that the when this tale originated the peak was covered in snow year round. That hasn't been the case for a few years now. We stopped for some cake at the hut on our way back down. I ordered so much (for myself) that I got two spoons with my plate ;-) Relaxing hike down to the hotel above the lake where we made the 4:30 bus. 1280m climb, 2200m descent, ~21km distance. Thanks to my companions for a great trip! Looking forwards to going again. Brauchst du wirklich noch Berg Lake? Viel Spass auch weiterhin am Hiken. Und die Mama sitzt hier und macht sich ab und zu ein wenig Sorgen!! Gletscherspalten sind nicht wirklich schoen :( Pass auf dich auf!! Die Bergfaszintation kann ich verstehen, es treibt uns auch immer wieder hinauf, so einen richtigen Bezug dazu habe ich erst hier gefunden, weil es einfach so grandios ist. Wie sieht es mit dem Pacific Crest Trail aus? Von Manning Parc bis Mexico in einem halben Jahr. Auf Teilen dieses Trails sind wir gewesen, was Tagestouren so hergeben, aber es reizt uns sehr, vielleicht nicht in einem Rutsch. Aber prickeln tut es. Ich dachte eher an den Great Divide Trail. Mag aber gut sein, dass die sich zumindest teilweise überschneiden. Über den PCT hab ich noch nicht viel gelesen.